"Manchu" redirects here. For other uses, see Manchu (disambiguation). "Man people" redirects here. It is not to be confused with Nanman. The Manchu [note 2] (Manchu: ᠮᠠᠨᠵᡠ; Möllendorff: manju; Abkai: manju; simplified Chinese: 满族; traditional Chinese: 滿族; pinyin: Mǎnzú; Wade–Giles: Man3-tsu2) are an ethnic minority in China and the people from Manchuria derives its name. They are sometimes called "red-tasseled Manchus", a reference to the ornamentation on traditional Manchu hats. The Later Jin (1616–1636), and Qing dynasty (1636–1912) were established and ruled by Manchus, who are descended from the Jurchen people who earlier established the Jin dynasty (1115–1234) in China. Manchu shamanism, Buddhism, Chinese folk religion, and Roman Catholic. Manchus form the largest branch of the Tungusic peoples and are distributed throughout China, forming the fourth largest ethnic group in the country. They can be found in 31 Chinese provincial regions. They also form the largest minority group in China without an autonomous region. Among them, Liaoning has the largest population and Hebei, Heilongjiang, Jilin, Inner Mongolia and Beijing have over 100,000 Manchu residents. About half of the population live in Liaoning and one-fifth in Hebei. There are a number of Manchu autonomous counties in China, such as Xinbin, Xiuyan, Qinglong, Fengning, Yitong, Qingyuan, Weichang, Kuancheng, Benxi, Kuandian, Huanren, Fengcheng, Beizhen[note 3] and over 300 Manchu towns and townships. The Jiu Manzhou Dang contains the earliest use of Manchu. However, the actual etymology of the ethnic name "Manju" is debatable. According to the Qing dynasty's official historical record, the Researches on Manchu Origins, the ethnic name came from Mañjuśrī. The Qianlong Emperor also supported the point of view and even wrote several poems on the subject. Meng Sen, a famous scholar of the Qing dynasty, agreed, too. On the other hand, he thought the name "Manchu" was also related to Li Manzhu (李滿住), the chieftain of the Jianzhou Jurchens. It was just the most respectful appellation in the society of the Jianzhou Jurchens in Meng's mind. Another scholar, Chang Shan, thinks Manju is a compound word. "Man" was from the word "mangga" (ᠮᠠᠩᡤᠠ) which means strong and "ju" (ᠵᡠ) means arrow. So Manju actually means "intrepid arrow". There are other hypotheses, such as Fu Sinian's "etymology of Jianzhou"; Zhang Binglin's "etymology of Manshi"; Isamura Sanjiro's "etymology of Wuji and Mohe"; Sun Wenliang's "etymology of Manzhe"; "etymology of mangu(n) river" and so on. The Manchus are descended from the Jurchen people who earlier established the Jin dynasty (1115–1234) in China, but as early as the semi-mythological chronicles of the Three Sovereigns and Five Emperors there is mention of the Sushen, a Tungusic people from the northern Manchurian region of northeast Asia, who paid bows and arrows as tribute to Emperor Shun and later to the Zhou dynasty. The Sushen used flint-headed wooden arrows, farmed, hunted and fished, and lived in caves and trees. The cognates Sushen or Jichen (稷真) again appear in the Shan Hai Jing and Book of Wei during the dynastic era referring to the Tungusic Mohe tribes of the far northeast. The Mohe practiced pig farming extensively and were mainly sedentary, and also used both pig and dog skins for coats. They were predominantly farmers and grew soybeans, wheat, millet and rice, in addition to hunting. In the 10th century AD, the term Jurchen first appeared in documents of the late Tang dynasty in reference to the state of Balhae in present-day northeastern China. Following the fall of Balhae, the Jurchens became vassals of the Khitan-led Liao dynasty. The Jurchens in the Yalu River region were tributaries of Goryeo since the reign of Wang Geon, who called upon them during the wars of the Later Three Kingdoms period, but the Jurchens switched allegiance between Liao and Goryeo multiple times, taking advantage of the tension between the two nations; posing a potential threat to Goryeo's border security, the Jurchens offered tribute to the Goryeo court, expecting lavish gifts in return. In the year 1114, Wanyan Aguda united the Jurchen tribes and established the Jin dynasty (1115–1234). His brother and successor, Wanyan Wuqimai defeated the Liao dynasty. After the fall of the Liao dynasty, the Jurchens went to war with the Northern Song dynasty, and captured most of northern China in the Jin–Song wars. During the Jin dynasty, the first Jurchen script came into use in the 1120s. It was mainly derived from the Khitan script. The Jurchens were sedentary, settled farmers with advanced agriculture. They farmed grain and millet as their cereal crops, grew flax, and raised oxen, pigs, sheep and horses. Their farming way of life was very different from the pastoral nomadism of the Mongols and the Khitans on the steppes. In 1206, the Mongols, vassals to the Jurchens, rose in Mongolia. Their leader, Genghis Khan, led Mongol troops against the Jurchens, who were finally defeated by Ögedei Khan in 1234. Under the Mongols' control, the Jurchens were divided into two groups and treated differently: the ones who were born and raised in North China and fluent in Chinese were considered to be Chinese (Han), but the people who were born and raised in the Jurchen homeland (Manchuria) without Chinese-speaking abilities were treated as Mongols politically. From that time, the Jurchens of North China increasingly merged with the Han Chinese while those living in their homeland started to be Mongolized. They adopted Mongolian customs, names [note 4] and the Mongolian language. As time went on, fewer and fewer Jurchens could recognize their own script. The Mongol-led Yuan dynasty was replaced by the Ming dynasty in 1368. In 1387, Ming forces defeated the Mongol commander Naghachu's resisting forces who settled in the Haixi area and began to summon the Jurchen tribes to pay tribute. At the time, some Jurchen clans were vassals to the Joseon dynasty of Korea such as Odoli and Huligai. Their elites served in the Korean royal bodyguard. The Joseon Koreans tried to deal with the military threat posed by the Jurchen by using both forceful means and incentives, and by launching military attacks. At the same time they tried to appease them with titles and degrees, traded with them, and sought to acculturate them by having Jurchens integrate into Korean culture. Despite these measures, however, fighting continued between the Jurchen and the Koreans. Their relationship was eventually stopped by the Ming dynasty government who wanted the Jurchens to protect the border. In 1403, Ahacu, chieftain of Huligai, paid tribute to the Yongle Emperor of the Ming dynasty. Soon after that, Möngke Temür, chieftain of the Odoli clan of the Jianzhou Jurchens, defected from paying tribute to Korea, becoming a tributary state to China instead. Yi Seong-gye, the Taejo of Joseon, asked the Ming Empire to send Möngke Temür back but was refused. The Yongle Emperor was determined to wrest the Jurchens out of Korean influence and have China dominate them instead. Korea tried to persuade Möngke Temür to reject the Ming overtures, but was unsuccessful, and Möngke Temür submitted to the Ming Empire. Since then, more and more Jurchen tribes presented tribute to the Ming Empire in succession. The Ming divided them into 384 guards, and the Jurchen became vassals to the Ming Empire. During the Ming dynasty, the name for the Jurchen land was Nurgan. The Jurchens became part of the Ming dynasty's Nurgan Regional Military Commission under the Yongle Emperor, with Ming forces erecting the Yongning Temple Stele in 1413, at the headquarters of Nurgan. The stele was inscribed in Chinese, Jurchen, Mongolian, and Tibetan. In 1449, Mongol taishi Esen attacked the Ming Empire and captured the Zhengtong Emperor in Tumu. Some Jurchen guards in Jianzhou and Haixi cooperated with Esen's action, but more were attacked in the Mongol invasion. Many Jurchen chieftains lost their hereditary certificates granted by the Ming government. They had to present tribute as secretariats (中书舍人) with less reward from the Ming court than in the time when they were heads of guards – an unpopular development. Subsequently, more and more Jurchens recognised the Ming Empire's declining power due to Esen's invasion. The Zhengtong Emperor's capture directly caused Jurchen guards to go out of control. Tribal leaders, such as Cungšan[note 5] and Wang Gao, brazenly plundered Ming territory. At about this time, the Jurchen script was officially abandoned. More Jurchens adopted Mongolian as their writing language and fewer used Chinese. The final recorded Jurchen writing dates to 1526. The Manchus are sometimes mistakenly identified as nomadic people. The Manchu way of life (economy) was agricultural, farming crops and raising animals on farms. Manchus practiced slash-and-burn agriculture in the areas north of Shenyang. The Haixi Jurchens were "semi-agricultural, the Jianzhou Jurchens and Maolian (毛怜) Jurchens were sedentary, while hunting and fishing was the way of life of the "Wild Jurchens". Han Chinese society resembled that of the sedentary Jianzhou and Maolian, who were farmers. Hunting, archery on horseback, horsemanship, livestock raising, and sedentary agriculture were all part of the Jianzhou Jurchens' culture. Although Manchus practiced equestrianism and archery on horseback, their immediate progenitors practiced sedentary agriculture. The Manchus also partook in hunting but were sedentary. Their primary mode of production was farming while they lived in villages, forts, and walled towns. Their Jurchen Jin predecessors also practiced farming. 建州毛怜则渤海大氏遗孽，乐住种，善缉纺，饮食服用，皆如华人，自长白山迤南，可拊而治也。 "The (people of) Chien-chou and Mao-lin [YLSL always reads Mao-lien] are the descendants of the family Ta of Po-hai. They love to be sedentary and sew, and they are skilled in spinning and weaving. As for food, clothing and utensils, they are the same as (those used by) the Chinese. Those living south of the Ch'ang-pai mountain are apt to be soothed and governed." Although their Mohe ancestors did not respect dogs, the Jurchens began to respect dogs around the time of the Ming dynasty, and passed this tradition on to the Manchus. It was prohibited in Jurchen culture to use dog skin, and forbidden for Jurchens to harm, kill, or eat dogs. For political reasons, the Jurchen leader Nurhaci chose variously to emphasize either differences or similarities in lifestyles with other peoples like the Mongols. Nurhaci said to the Mongols that "the languages of the Chinese and Koreans are different, but their clothing and way of life is the same. It is the same with us Manchus (Jušen) and Mongols. Our languages are different, but our clothing and way of life is the same." Later Nurhaci indicated that the bond with the Mongols was not based in any real shared culture. It was for pragmatic reasons of "mutual opportunism," since Nurhaci said to the Mongols: "You Mongols raise livestock, eat meat, and wear pelts. My people till the fields and live on grain. We two are not one country and we have different languages." A century after the chaos started in the Jurchen lands, Nurhaci, a chieftain of the Jianzhou Left Guard, began a campaign against the Ming Empire in revenge for their manslaughter of his grandfather and father in 1583. He reunified the Jurchen tribes, established a military system called the "Eight Banners", which organized Jurchen soldiers into groups of "Bannermen", and ordered his scholar Erdeni and minister Gagai to create a new Jurchen script (later known as Manchu script) using the traditional Mongolian alphabet as a reference. ᡤᡠᡵᡠᠨ; Möllendorff: daicing gurun; Abkai: daiqing gurun[note 7]). Factors for the change of name of these people from Jurchen to Manchu include the fact that the term "Jurchen" had negative connotations since the Jurchens had been in a servile position to the Ming dynasty for several hundred years, and it also referred to people of the "dependent class". In 1644, the Ming capital, Beijing, was sacked by a peasant revolt led by Li Zicheng, a former minor Ming official who became the leader of the peasant revolt, who then proclaimed the establishment of the Shun dynasty. The last Ming ruler, the Chongzhen Emperor, committed suicide by hanging himself when the city fell. When Li Zicheng moved against the Ming general Wu Sangui, the latter made an alliance with the Manchus and opened the Shanhai Pass to the Manchu army. After the Manchus defeated Li Zicheng, they moved the capital of their new Qing Empire to Beijing (Manchu: ᠪᡝᡤᡳᠩ; Möllendorff: beging; Abkai: beging) in the same year. The Qing government differentiated between Han Bannermen and ordinary Han civilians. Han Bannermen were Han Chinese who defected to the Qing Empire up to 1644 and joined the Eight Banners, giving them social and legal privileges in addition to being acculturated to Manchu culture. So many Han defected to the Qing Empire and swelled up the ranks of the Eight Banners that ethnic Manchus became a minority within the Banners, making up only 16% in 1648, with Han Bannermen dominating at 75% and Mongol Bannermen making up the rest. It was this multi-ethnic, majority Han force in which Manchus were a minority, which conquered China for the Qing Empire. A mass marriage of Han Chinese officers and officials to Manchu women to balance the massive number of Han women who entered the Manchu court as courtesans, concubines, and wives. These couples were arranged by Prince Yoto and Hong Taiji in 1632 to promote harmony between the two ethnic groups. Also to promote ethnic harmony, a 1648 decree from the Shunzhi Emperor allowed Han Chinese civilian men to marry Manchu women from the Banners with the permission of the Board of Revenue if they were registered daughters of officials or commoners or the permission of their banner company captain if they were unregistered commoners. It was only later in the dynasty that these policies allowing intermarriage were done away with. As a result of their conquest of China, almost all the Manchus followed the prince regent Dorgon and the Shunzhi Emperor to Beijing and settled there. A few of them were sent to other places such as Inner Mongolia, Xinjiang and Tibet to serve as garrison troops. There were only 1524 Bannermen left in Manchuria at the time of the initial Manchu conquest. After a series of border conflicts with the Russians, the Qing emperors started to realize the strategic importance of Manchuria and gradually sent Manchus back where they originally came from. But throughout the Qing dynasty, Beijing was the focal point of the ruling Manchus in the political, economic and cultural spheres. The Yongzheng Emperor noted: "Garrisons are the places of stationed works, Beijing is their homeland." While the Manchu ruling elite at the Qing imperial court in Beijing and posts of authority throughout China increasingly adopted Han culture, the Qing imperial government viewed the Manchu communities (as well as those of various tribal people) in Manchuria as a place where traditional Manchu virtues could be preserved, and as a vital reservoir of military manpower fully dedicated to the regime. The Qing emperors tried to protect the traditional way of life of the Manchus (as well as various other tribal peoples) in central and northern Manchuria by a variety of means. In particular, they restricted the migration of Han settlers to the region. This had to be balanced with practical needs, such as maintaining the defense of northern China against the Russians and the Mongols, supplying government farms with a skilled work force, and conducting trade in the region's products, which resulted in a continuous trickle of Han convicts, workers, and merchants to the northeast. This policy of artificially isolating the Manchus of the northeast from the rest of China could not last forever. In the 1850s, large numbers of Manchu bannermen were sent to central China to fight the Taiping rebels. (For example, just the Heilongjiang province – which at the time included only the northern part of today's Heilongjiang – contributed 67,730 bannermen to the campaign, of whom only 10–20% survived). Those few who returned were demoralized and often disposed to opium addiction. In 1860, in the aftermath of the loss of "Outer Manchuria", and with the imperial and provincial governments in deep financial trouble, parts of Manchuria became officially open to Chinese settlement; within a few decades, the Manchus became a minority in most of Manchuria's districts. ᠨᡳᠶᠠᠯᠮᠠ Dulimbai gurun-i niyalma) referred to all the Han, Manchu, and Mongol subjects of the Qing Empire. When the Qing Empire conquered Dzungaria in 1759, it proclaimed that the new land was absorbed into "China" (Dulimbai Gurun) in a Manchu language memorial. The Qing government expounded in its ideology that it was bringing the "outer" non-Han Chinese like the Inner Mongols, Eastern Mongols, Oirat Mongols, and Tibetans together with the "inner" Han Chinese into "one family" united in the Qing state. The Qing government used the phrase "Zhongwai yijia" 中外一家 or "neiwai yijia" 內外一家 ("interior and exterior as one family") to convey this idea of unification of the different peoples of their empire. A Manchu language version of a treaty with the Russian Empire concerning criminal jurisdiction over bandits called people from the Qing Empire as "people of the Central Kingdom (Dulimbai Gurun)". In the Manchu official Tulisen's Manchu language account of his meeting with the Torghut leader Ayuka Khan, it was mentioned that while the Torghuts were unlike the Russians, the "people of the Central Kingdom" (dulimba-i gurun 中國, Zhongguo) were like the Torghuts; "people of the Central Kingdom" meant Manchus. It was possible for Han Bannermen and Han bondservants (booi) to become Manchu by being transferred into the upper three Manchu Banners and having their surname "Manchufied" with the addition of a "giya" (佳) as a suffix. The process was called taiqi (抬旗; 'raising of the banner') in Chinese. It typically occurred in cases of intermarriage with the Aisin Gioro clan (the imperial clan); close relatives (fathers and brothers) of the concubine or Empress would get promoted from the Han Banner to the Manchu Banner and become Manchu. Many Manchu Bannermen in Beijing supported the Boxers in the Boxer Rebellion and shared their anti-foreign sentiment. The Manchu Bannermen were devastated by the fighting during the First Sino-Japanese War and the Boxer Rebellion, sustaining massive casualties during the wars and subsequently being driven into extreme suffering and hardship. Much of the fighting in the Boxer Rebellion against the foreigners in defense of Beijing and Manchuria was done by Manchu Banner armies, which were destroyed while resisting the invasion. The German Minister Clemens von Ketteler was assassinated by a Manchu. Thousands of Manchus fled south from Aigun during the fighting in the Boxer Rebellion in 1900, their cattle and horses then stolen by Russian Cossacks who razed their villages and homes. The clan system of the Manchus in Aigun was obliterated by the despoliation of the area at the hands of the Russian invaders. By the 19th century, most Manchus in the city garrison spoke only Mandarin Chinese, not Manchu, which still distinguished them from their Han neighbors in southern China, who spoke non-Mandarin dialects. That they spoke Beijing dialect made recognizing Manchus relatively easy. It was northern Standard Chinese which the Manchu Bannermen spoke instead of the local dialect the Han people around the garrison spoke, so that Manchus in the garrisons at Jingzhou and Guangzhou both spoke Mandarin even though Cantonese was spoken at Guangzhou, and the Beijing dialect distinguished the Manchu bannermen at the Xi'an garrison from other people. Many Manchu Bannermen got jobs as Mandarin teachers, writing textbooks for learning Mandarin and instructing people in Mandarin. In Guangdong, the Manchu Mandarin teacher Sun Yizun advised that the Yinyun Chanwei and Kangxi Zidian, dictionaries issued by the Qing government, were the correct guides to Mandarin pronunciation, rather than the pronunciation of the Beijing and Nanjing dialects. For teaching the Beijing dialect, Kyugaigo, the Japanese foreign language school, hired a Manchu in 1876. The Han Chinese Li Guojie, the grandson of Li Hongzhang, married the Manchu daughter of Natong (那桐), the Grand Secretary (大學士). Most intermarriage consisted of Han Bannermen marrying Manchus in areas like Aihun. Han Chinese Bannermen wedded Manchus and there was no law against this. As the end of the Qing dynasty approached, Manchus were portrayed as outside colonizers by Chinese nationalists such as Sun Yat-sen, even though the Republican revolution he brought about was supported by many reform-minded Manchu officials and military officers. This portrayal dissipated somewhat after the 1911 revolution as the new Republic of China now sought to include Manchus within its national identity. In order to blend in, some Manchus switched to speaking the local dialect instead of Standard Chinese. By the early years of the Republic of China, very few areas of China still had traditional Manchu populations. Among the few regions where such comparatively traditional communities could be found, and where the Manchu language was still widely spoken, were the Aigun (Manchu: ᠠᡳ᠌ᡥᡡᠨ; Möllendorff: aihūn; Abkai: aihvn) District and the Qiqihar (Manchu: ᠴᡳᠴᡳᡤᠠᡵ; Möllendorff: cicigar; Abkai: qiqigar) District of Heilongjiang Province. Until 1924, the Chinese government continued to pay stipends to Manchu bannermen, but many cut their links with their banners and took on Han-style names to avoid persecution. The official total of Manchus fell by more than half during this period, as they refused to admit their ethnicity when asked by government officials or other outsiders. On the other hand, in warlord Zhang Zuolin's reign in Manchuria, much better treatment was reported. There was no particular persecution of Manchus. Even the mausoleums of Qing emperors were still allowed to be managed by Manchu guardsmen, as in the past. Many Manchus joined the Fengtian clique, such as Xi Qia, a member of the Qing dynasty's imperial clan. As a follow-up to the Mukden Incident, Manchukuo, a puppet state in Manchuria, was created by the Empire of Japan which was nominally ruled by the deposed Last Emperor, Puyi, in 1932. Although the nation's name implied a primarily Manchu affiliation, it was actually a completely new country for all the ethnicities in Manchuria, which had a majority Han population and was opposed by many Manchus as well as people of other ethnicities who fought against Japan in the Second Sino-Japanese War. The Japanese Ueda Kyōsuke labeled all 30 million people in Manchuria "Manchus", including Han Chinese, even though most of them were not ethnic Manchu, and the Japanese-written "Great Manchukuo" built upon Ueda's argument to claim that all 30 million "Manchus" in Manchukuo had the right to independence to justify splitting Manchukuo from China. In 1942, the Japanese-written "Ten Year History of the Construction of Manchukuo" attempted to emphasize the right of ethnic Japanese to the land of Manchukuo while attempting to delegitimize the Manchus' claim to Manchukuo as their native land, noting that most Manchus moved out during the Qing dynasty and only returned later. In 1952, after the failure of both Manchukuo and the Nationalist Government (KMT), the newborn People's Republic of China officially recognized the Manchu as one of the ethnic minorities in 1952 as Mao Zedong had criticized the Han chauvinism that dominated the KMT. In the 1953 census, 2.5 million people identified themselves as Manchu. The Communist government also attempted to improve the treatment of Manchu people; some Manchu people who had hidden their ancestry during the period of KMT rule became willing to reveal their ancestry, such as the writer Lao She, who began to include Manchu characters in his fictional works in the 1950s. Between 1982 and 1990, the official count of Manchu people more than doubled from 4,299,159 to 9,821,180, making them China's fastest-growing ethnic minority, but this growth was only on paper, as people formerly registered as Han applied for official recognition as Manchu. Since the 1980s, thirteen Manchu autonomous counties have been created in Liaoning, Jilin, Hebei, and Heilongjiang. The Eight Banners system is one of the most important ethnic identity of today's Manchu people. So nowadays, Manchus are more like an ethnic coalition which not only contains the descendants of Manchu bannermen, also has a large number of Manchu-assimilated Chinese and Mongol bannermen. However, Solon and Sibe Bannermen who were considered as part of Eight Banner system under the Qing dynasty were registered as independent ethnic groups by the PRC government as Daur, Evenk, Nanai, Oroqen, and Sibe. Since the 1980s, the reform after Cultural Revolution, there has been a renaissance of Manchu culture and language among the government, scholars and social activities with remarkable achievements. It was also reported that the resurgence of interest also spread among Han Chinese. In modern China, Manchu culture and language preservation is promoted by the Communist Party of China, and Manchus once again form one of the most socioeconomically advanced minorities within China. Manchus generally face little to no discrimination in their daily lives, there is however, a remaining anti-Manchu sentiment amongst extremist Han nationalists. It is particularly common with participants of the Hanfu movement who subscribe to conspiracy theories about Manchu people, such as the Chinese Communist Party being occupied by Manchu elites hence the better treatment Manchus receive under the People's Republic of China in contrast to their persecution under the KMT's Republic Of China rule. Most Manchu people now live in Mainland China with a population of 10,410,585, which is 9.28% of ethnic minorities and 0.77% of China's total population. Among the provincial regions, there are two provinces, Liaoning and Hebei, which have over 1,000,000 Manchu residents. Liaoning has 5,336,895 Manchu residents which is 51.26% of Manchu population and 12.20% provincial population; Hebei has 2,118,711 which is 20.35% of Manchu people and 70.80% of provincial ethnic minorites. Manchus are the largest ethnic minority in Liaoning, Hebei, Heilongjiang and Beijing; 2nd largest in Jilin, Inner Mongolia, Tianjin, Ningxia, Shaanxi and Shanxi and 3rd largest in Henan, Shandong and Anhui. Manchu autonomous area in Jilin. Manchu autonomous area in Hebei. Manchu people can be found living outside mainland China. There are approximately 12,000 Manchus now in Taiwan. Most of them moved to Taiwan with the ROC government in 1949. One notable example was Puru, a famous painter, calligrapher and also the founder of the Manchu Association of Republic of China. There are also Manchus who settled in the United States. On the 2000 US Census, 379 Americans were of Manchurian ancestry, such as the 33rd Judge Advocate General of the U.S. Army John Fugh. The Manchus implemented measures to "Manchufy" the other Tungusic peoples living around the Amur River basin. The southern Tungusic Manchus influenced the northern Tungusic peoples linguistically, culturally, and religiously. The Manchu language is a Tungusic language and has many dialects. Its standard form is called "Standard Manchu". It originates from the accent of Jianzhou Jurchens and was officially standardized during the Qianlong Emperor's reign. During the Qing dynasty, Manchus at the imperial court were required to speak Standard Manchu or face the emperor's reprimand. This applied equally to the palace presbyter for shamanic rites when performing sacrifice. "Beijing dialect" is one of the most commonly used. It was a mix of several dialects, since the Manchus who lived in Beijing were not only Jianzhou Jurchens, but also Haixi Jurchens and Yeren Jurchens. Over time,[clarify] the mingling of their accents produced Beijing dialect (京语)[clarify]. Beijing dialect is very close to Standard Manchu. 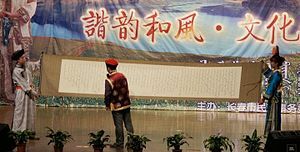 Mukden dialect, aka Mukden-South Manchurian dialect (盛京南满语) or Mukden-Girin dialect (盛京吉林语)[clarify], is another popular dialect that was originally spoken by Manchus who lived in Liaoning and the western and southern areas of Jilin, having an accent very close to the Xibe language spoken by the Xibes living in Qapqal. Other dialects include Ningguta and Alcuka. ᡥᡝᡵᡤᡝᠨ; Möllendorff: tongki fuka akū hergen; Abkai: tongki fuka akv hergen; 无圈点满文) or "old Manchu script" (老满文). Due to its hurried creation, the script has its defects. Some vowels and consonants were difficult to distinguish. Shortly afterwards, their successor Dahai used dots and circles to distinguish vowels, aspirated and non-aspirated consonants and thus completed the script. His achievement is called "script with dots and circles" or "new Manchu script". ᠪᠣᡠ᠋; Möllendorff: ilan boo; Abkai: ilan bou), Heilongjiang Province. Since the 1980s, there has been a resurgence of the Manchu language among the government, scholars and social activities. In recent years, with the help of the governments in Liaoning, Jilin and Heilongjiang, many schools started to have Manchu classes. There are also Manchu volunteers in many places of China who freely teach Manchu in the desire to rescue the language. Thousands of non-Manchus have learned the language through these platforms. The Qing dynasty is mistakenly confused as a nomadic empire by people who wrongly think that the Manchus were a nomadic people, when in fact the Manchus were a sedentary agricultural people who lived in fixed villages, farmed crops, practiced hunting and mounted archery. The history of Manchu family names is quite long. Fundamentally, it succeeds the Jurchen family name of the Jin dynasty. However, after the Mongols extinguished the Jin dynasty, the Manchus started to adopt Mongol culture, including their custom of using only their given name until the end of the Qing dynasty, a practice confounding non-Manchus, leading them to conclude, erroneously, that they simply do not have family names. A Manchu family name usually has two portions: the first is "Mukūn" (ᠮᡠᡴᡡᠨ, Abkai: Mukvn) which literally means "branch name"; the second, "Hala" (ᡥᠠᠯᠠ), represents the name of a person's clan. According to the Book of the Eight Manchu Banners' Surname-Clans (八旗滿洲氏族通譜), there are 1,114 Manchu family names. Gūwalgiya, Niohuru, Šumulu, Tatara, Gioro, Nara are considered as "famous clans" (著姓) among Manchus. There were stories of Han migrating to the Jurchens and assimilating into Manchu Jurchen society and Nikan Wailan may have been an example of this. The Manchu Cuigiya (崔佳氏) clan claimed that a Han Chinese founded their clan. [full citation needed] The Tohoro (托活络) clan (Duanfang's clan) claimed Han Chinese origin. Manchus given names are distinctive. Generally, there are several forms, such as bearing suffixes "-ngga", "-ngge" or "-nggo", meaning "having the quality of"; bearing Mongol style suffixes "-tai" or "-tu", meaning "having"; bearing the suffix, "-ju", "-boo"; numerals [note 9] or animal names[note 10]. Some ethnic names can also be a given name of the Manchus. One of the common first name for the Manchus is Nikan (Han Chinese). For example, Nikan Wailan was a Jurchen leader who was an enemy of Nurhaci. 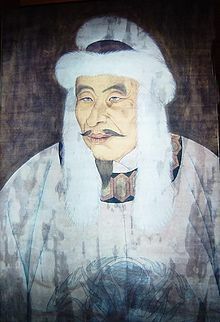 Nikan was also the name of one the Aisin Gioro Princes and grandsons of Nurhaci who supported Prince Dorgon. Nurhaci's first son was Cuyen, one of whose sons was Nikan. The Jurchens and their Manchu descendants originally practiced cremation as part of their culture. They adopted the practice of burial from the Han Chinese, but many Manchus continued to cremate their dead. Princes were cremated on pyres. The traditional hairstyle for Manchu men is shaving the front of their heads while growing the hair on the back of their heads into a single braid called a queue (辮子; biànzi), which was known as soncoho in Manchu. Manchu women wore their hair in a distinctive hairstyle called liangbatou (兩把頭). The early phase of Manchu clothing succeeded from Jurchen tradition. White was the dominating color. To facilitate convenience during archery, the robe is the most common article of clothing for the Manchu people. Over the robe, a surcoat is usually worn, derived from the military uniform of Eight Banners army. During the Kangxi period, the surcoat gained popularity among commoners. The modern Chinese suits, the Cheongsam and Tangzhuang, are derived from the Manchu robe and surcoat which are commonly considered as "Chinese elements". Wearing hats is also a part of traditional Manchu culture, and Manchu people wear hats in all ages and seasons in contrast to the Han Chinese culture of "Starting to wear hats at 20 year-old" (二十始冠), . Manchu hats are either formal or casual, formal hats being made in two different styles, straw for spring and summer, and fur for fall and winter. Casual hats are more commonly known as "Mandarin hats" in English. Manchus have many distinctive traditional accessories. Women traditionally wear three earrings on each ear, a tradition that is maintained by many older Manchu women. Males also traditionally wear piercings, but they tend to only have one earring in their youth and do not continue to wear it as adults. The Manchu people also have traditional jewelry which evokes their past as hunters. The fergetun (ᡶᡝᡵᡤᡝᡨᡠᠨ), a thumb ring traditionally made out of reindeer bone, was worn to protect the thumbs of archers. After the establishment of the Qing dynasty in 1644, the fergetun gradually became simply a form of jewelry, with the most valuable ones made in jade and ivory. High-heeled shoes were worn by Manchu women. Riding and archery (Manchu: ᠨᡳᠶᠠᠮᠨᡳᠶᠠᠨ; Möllendorff: niyamniyan; Abkai: niyamniyan) are significant to the Manchus. They were well-trained horsemen from their teenage years. Huangtaiji said, "Riding and archery are the most important martial arts of our country". Every generation of the Qing dynasty treasured riding and archery the most. Every spring and fall, from ordinary Manchus to aristocrats, all had to take riding and archery tests. Their test results could even affect their rank in the nobility. The Manchus of the early Qing dynasty had excellent shooting skills and their arrows were reputed to be capable of penetrating two persons. From the middle period of the Qing dynasty, archery became more a form of entertainment in the form of games such as hunting swans, shooting fabric or silk target. The most difficult is shooting a candle hanging in the air at night. Gambling was banned in the Qing dynasty but there was no limitation on Manchus engaging in archery contests. It was common to see Manchus putting signs in front of their houses to invite challenges. After the Qianlong period, Manchus gradually neglected the practices of riding and archery, even though their rulers tried their best to encourage Manchus to continue their riding and archery traditions, but the traditions are still kept among some Manchus even nowadays. Manchu wrestling (Manchu: ᠪᡠᡴᡠ; Möllendorff: buku; Abkai: buku)  is also an important martial art of the Manchu people. Buku, meaning "wrestling" or "man of unusual strength" in Manchu, was originally from a Mongolian word, "bökh". The history of Manchu wrestling can be traced back to Jurchen wrestling in the Jin dynasty which was originally from Khitan wrestling; it was very similar to Mongolian wrestling. In the Yuan dynasty, the Jurchens who lived in northeast China adopted Mongol culture including wrestling, bökh. In the latter Jin and early Qing period, rulers encouraged the populace, including aristocrats, to practise buku as a feature of military training. At the time, Mongol wrestlers were the most famous and powerful. By the Chongde period, Manchus had developed their own well-trained wrestlers and, a century later, in the Qianlong period, they surpassed Mongol wrestlers. 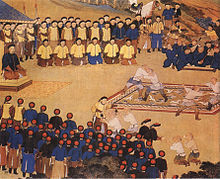 The Qing court established the "Shan Pu Battalion" and chose 200 fine wrestlers divided into three levels. Manchu wrestling moves can be found in today's Chinese wrestling, shuai jiao, which is its most important part. Among many branches, Beijing wrestling adopted most Manchu wrestling moves. As a result of their hunting ancestry, Manchus are traditionally interested in falconry. Gyrfalcon (Manchu: ᡧᠣᠩᡴᠣᡵᠣ; Möllendorff: šongkoro; Abkai: xongkoro) is the most highly valued discipline in the Manchu falconry social circle. In the Qing period, giving a gyrfalcon to the royal court in tribute could be met with a considerable reward. There were professional falconers in Ningguta area (today's Heilongjiang province and the northern part of Jilin province). It was a big base of falconry. Beijing's Manchus also like falconry. Compared to the falconry of Manchuria, it is more like an entertainment. Imperial Household Department of Beijing had professional falconers, too. They provided outstanding falcons to the emperor when he went to hunt every fall. Even today, Manchu traditional falconry is well practised in some regions. ᡝᡶᡳᠨ; Möllendorff: nisume efire efin; Abkai: nisume efire efin) is another Manchu pastime. The Qianlong Emperor called it a "national custom". It was one of the most important winter events of the Qing royal household, performed by the "Eight Banner Ice Skating Battalion" (八旗冰鞋营) which was a special force trained to do battle on icy terrain. The battalion consisted of 1600 soldiers. In the Jiaqing period, it was reduced to 500 soldiers and transferred to the Jing Jie Battalion (精捷营) originally, literally meaning "chosen agile battalion". In the 1930s–1940s, there was a famous Manchu skater in Beijing whose name was Wu Tongxuan, from the Uya clan and one of the royal household skaters in Empress Dowager Cixi's regency. He frequently appeared in many of Beijing's skating rinks. Nowadays, there are still Manchu figure skaters; world champions Zhao Hongbo and Tong Jian are the pre-eminent examples. ᠪᡳᡨ᠌ᡥᡝ; Möllendorff: nišan saman i bithe; Abkai: nixan saman-i bithe; 尼山萨满传) is the most important piece of Manchu literature. It primarily recounts how Nisan Shaman helps revive a young hunter. The story also spread to Xibe, Nanai, Daur, Oroqen, Evenk and other Tungusic peoples. It has four versions: the handwriting version from Qiqihar; two different handwriting versions from Aigun; and the one by the Manchu writer Dekdengge in Vladivostok (Manchu: ᡥᠠᡳ᠌ᡧᡝᠨᠸᡝᡳ; Möllendorff: haišenwei; Abkai: haixenwei). The four versions are similar, but Haišenwei's is the most complete. It has been translated into Russian, Chinese, English and other languages. There is also literature written in Chinese by Manchu writers, such as the Tale of Heroic Sons and Daughters (儿女英雄传), Song Of Drinking Water (饮水词) and The collection of Tianyouge (天游阁集). Octagonal drum is a type of Manchu folk art that was very popular among bannermen, especially in Beijing. It is said that octagonal drum originated with the snare drum of the Eight-banner military and the melody was made by the banner soldiers who were on the way back home from victory in the battle of Jinchuan. The drum is composed of wood surrounded by bells. The drumhead is made by wyrmhide with tassels at the bottom. The colors of the tassels are yellow, white, red, and blue, which represent the four colors of the Eight Banners. When artists perform, they use their fingers to hit the drumhead and shake the drum to ring the bells. Traditionally, octagonal drum is performed by three people. One is the harpist; one is the clown who is responsible for harlequinade; and the third is the singer. "Zidishu" is the main libretto of octagonal drum and can be traced back to a type of traditional folk music called the "Manchu Rhythm". Although Zidishu was not created by Han Chinese, it still contains many themes from Chinese stories, such as Romance of the Three Kingdoms, Dream of the Red Chamber, Romance of the Western Chamber, Legend of the White Snake and Strange Stories from a Chinese Studio. Additionally, there are many works that depict the lives of Bannermen. Aisin Gioro Yigeng, who was pen named "Helü" and wrote the sigh of old imperial bodyguard, as the representative author. Zidishu involves two acts of singing, which are called dongcheng and xicheng. After the fall of the Qing dynasty, the influence of the octagonal drum gradually reduced. However, the Chinese monochord and crosstalk which derived from octagonal are still popular in Chinese society and the new generations. Many famous Chinese monochord performers and crosstalkers were the artists of octagonal drum, such as De Shoushan and Zhang Sanlu. Ulabun (ᡠᠯᠠᠪᡠᠨ) is a form of Manchu storytelling entertainment which is performed in the Manchu language. Different from octagonal drum, ulabun is popular among the Manchu people living in Manchuria. It has two main categories; one is popular folk literature such as the Tale of the Nisan Shaman, the other is from folk music with an informative and independent plot, and complete structure. Song Xidong aka. Akšan/Akxan (ᠠᡴᡧᠠᠨ) is a famous artist in performing ulabun. The religions of the Manchus are diverse. Originally, Manchus, and their predecessors, were principally Shamanists. After the conquest of China in the 17th century, Manchus came into contact with Chinese culture. They were markedly influenced by Chinese folk religion and retained only some Shamanic customs. Buddhism and Christianity also had their impacts. Shamanism has a long history in Manchu civilization and influenced them tremendously over thousands of years. John Keay states in A History Of China, shaman is the single loan-word from Manchurian into the English language. After the conquest of China in the 17th century, although Manchus widely adopted Chinese folk religion, Shamanic traditions can still be found in the aspects of soul worship, totem worship, belief in nightmares and apotheosis of philanthropists. Since the Qing rulers considered religion as a method of controlling other powers such as Mongolians and Tibetans, there was no privilege for Shamanism, their native religion. Apart from the Shamanic shrines in the Qing palace, no temples erected for worship of Manchu gods could be found in Beijing. Thus, the story of competition between Shamanists and Lamaists was oft heard in Manchuria but the Manchu emperor helped Lamaists to persecute Shamanists which led to their considerable frustration and dissatisfaction. Jurchens, the predecessors of the Manchus, were influenced by the Buddhism of Balhae, Goryeo, Liao and Song in the 10–13th centuries, so it was not something new to the rising Manchus in the 16–17th centuries. Qing emperors were always entitled "Buddha". They were regarded as Mañjuśrī in Tibetan Buddhism and had high attainments. However, Buddhism was used by rulers to control Mongolians and Tibetans; it was of little relevance to ordinary Manchus in the Qing dynasty. The belief in the Buddhist faith by the Mongols was viewed with disdain and thought to be destructive to Mongol identity by Hong Taiji. In private, Huangtaiji said "The Mongolian princes are abandoning the Mongolian language; their names are all in imitation of the lamas. ", although Huangtaiji patronized Tibetan Buddhism in public. The Manchus themselves, like Huangtaiji, did not personally believe in Tibetan Buddhism and did not want to convert. In fact the terms "incorrigibles" and "liars" were used to describe Tibetan Buddhist Lamas by Hung Taiji; however Huangtaiji patronized Buddhism in order to exploit the Tibetans' and Mongols' belief in the religion. The Qianlong Emperor's faith in Tibetan Buddhism has been questioned in recent times because the emperor indicated that he supported the Yellow Church (the Tibetan Buddhist Gelukpa sect) just to "maintain peace among the Mongols" since the Mongols were followers of the Dalai Lama and the Panchen Lama of the Yellow Church, and the Qianlong Emperor had this explanation placed in the Beijing Tibetan Buddhist Yonghe Gong temple on a stele entitled "Lama Shuo" (on Lamas) in 1792, and he also said it was "merely in pursuance of "Our policy of extending Our affection to the weak," which led him to patronize the Yellow Church. This explanation of only supporting the "Yellow Hats" Tibetan Buddhists for practical reasons was used to deflect Han criticism of this policy by the Qianlong Emperor, who had the "Lama Shuo" stele engraved in Tibetan, Mongol, Manchu and Chinese, which said: "By patronizing the Yellow Church we maintain peace among the Mongols. This being an important task, we cannot but protect this (religion). (In doing so) we do not show any bias, nor do we wish to adulate the Tibetan priests as (was done during the) Yuan dynasty." Manchus were affected by Chinese folk religions for most of the Qing dynasty. Save for ancestor worship, the gods they consecrated were virtually identical to those of the Han Chinese. Guan Yu worship is a typical example. He was considered as the God Protector of the Nation and was sincerely worshipped by Manchus. They called him "Lord Guan" (关老爷). Uttering his name was taboo. In addition, Manchus worshipped Cai Shen and the Kitchen God just as the Han Chinese did. The worship of Mongolian and Tibetan gods has also been reported. Influenced by the Jesuit missionaries in China, there were also a considerable number of Manchu Catholics during the Qing dynasty. The earliest Manchu Catholics appeared in the 1650s. In the Yongzheng eras, Depei, the Hošo Jiyan Prince, was a Catholic whose baptismal name was "Joseph". His wife was also baptised and named "Maria". At the same time, the sons of Doro Beile Sunu were devout Catholics, too. In the Jiaqing period, Tong Hengšan and Tong Lan were Catholic Manchu Bannermen. These Manchu Catholics were proselytized and persecuted by Qing emperors but they steadfastly refused to convert. There were Manchu Catholics in modern times, too, such as Ying Lianzhi, the founder of Fu Jen Catholic University. ᡳᠨᡝᠩᡤᡳ), on the 13th day of the tenth month of the lunar calendar, is the anniversary of the name creation of Manchu. This day in 1635, Hong Taiji changed the ethnic name from Jurchen to Manchu. Food Extermination Day (绝粮日), on every 26th day of the 8th month of the lunar calendar, is another example which was inspired by a story that once Nurhaci and his troops were in a battle with enemies and almost running out of food. The villagers who lived near the battlefield heard the emergency and came to help. There was no tableware on the battlefield. They had to use perilla leaves to wrap the rice. Afterwards, they won the battle. So later generations could remember this hardship, Nurhaci made this day the "Food Extermination Day". Traditionally on this day, Manchu people eat perilla or cabbage wraps with rice, scrambled eggs, beef or pork. ^ less than 100 native speakers. Several thousands can speak Manchu as second language through primary education or free classes for adults in China. ^ Fengcheng and Beizhen are cities but treated as Manchu autonomous counties. ^ Cungšan was considered as Nurhaci's direct ancestor by some viewpoints, but disagreements also exist. ^ The meaning of "daicing" (daiqing) is debatable. It has been reported that the word was imported from Mongolian means "fighting country"
^ e.g. Aisin Gioro Qixiang, a famous Chinese calligrapher. ^ e.g. Ying Batu, Ying Bayan, the sons of a famous Manchu director, Ying Da. ^ e.g. Aisin-Gioro Ulhicun, a famous scholar of Khitan and Manchu linguistic studies. ^ a b c d e f g h 《中国2010年人口普查资料（上中下）》 [Data of 2010 China Population Census]. China Statistics Press. 2012. ISBN 9787503765070. ^ "Research". Ethnicity Research (《民族研究》) (in Chinese) (1–12): 21. 1997. ^ a b "Ta Kung Pao: Manchu Language and Reviving Manchu Culture". 26 April 2015. Archived from the original on 8 November 2017. ^ 人民大学满语培训班重新开课 缺教室是最大难题-中新网. www.chinanews.com. 6 March 2012. ^ 金标的十年"满语梦"_资讯频道_凤凰网. news.ifeng.com. 12 December 2011. ^ "Manchu". Encyclopædia Britannica. Retrieved 18 March 2015. ^ lear. 词语"旗人"的解释 汉典 zdic.net. Retrieved 18 March 2015. ^ a b "Uyun Bilig: The Files of Chahar and Ligdan Khan in Ming Dynasty (simplified Chinese)". ^ Endymion Porter Wilkinson (2000). Chinese History: A Manual. Harvard Univ Asia Center. pp. 728–. ISBN 978-0-674-00249-4. ^ 《族称Manju词源探析》 [The Research of Ethnic Name "Manju"'s Origin]. 《满语研究》 [Manchu Language Research] (1). 2009. ^ Feng, Jiasheng (冯家升). 《满洲名称之种种推测》 [Many Kinds of Conjecture of the Name "Manju"]. 《东方杂志》 [Dongfang Magazine]. 30 (17). ^ Teng, Shaojian (滕绍箴) (April 1996). 《满洲名称考述》 [Textual Research of the Name "Manju"]. 《民族研究》 [Ethnicities Research]: 70–77. ^ Norman 2003, p. 484. ^ Huang, P.: "New Light on the Origins of the Manchu", Harvard Journal of Asiatic Studies, vol. 50, no.1 (1990): 239–82. Retrieved from JSTOR database July 18, 2006. ^ Huang 1990 p. 246. ^ 逸周書. Retrieved 18 March 2015. ^ Gorelova 2002, pp. 13–4. ^ Gorelova 2002, p. 14. ^ Breuker 2010, pp. 220–221. "The Jurchen settlements in the Amnok River region had been tributaries of Koryŏ since the establishment of the dynasty, when T'aejo Wang Kŏn heavily relied on a large segment of Jurchen cavalry to defeat the armies of Later Paekche. The position and status of these Jurchen is hard to determine using the framework of the Koryŏ and Liao states as reference, since the Jurchen leaders generally took care to steer a middle course between Koryŏ and Liao, changing sides or absconding whenever that was deemed the best course. As mentioned above, Koryŏ and Liao competed quite fiercely to obtain the allegiance of the Jurchen settlers who in the absence of large armies effectively controlled much of the frontier area outside the Koryŏ and Liao fortifications. These Jurchen communities were expert in handling the tension between Liao and Koryŏ, playing out divide-and-rule policies backed up by threats of border violence. It seems that the relationship between the semi-nomadic Jurchen and their peninsular neighbours bore much resemblance to the relationship between Chinese states and their nomad neighbours, as described by Thomas Barfield." ^ Sinor 1996, p. 416. ^ Twitchett, Franke, Fairbank 1994, p. 217. ^ de Rachewiltz 1993, p. 112. ^ Seth 2006, p. 138. ^ Seth 2010, p. 144. ^ Zhang 2008, p. 29. ^ John W. Dardess (2012). Ming China, 1368–1644: A Concise History of a Resilient Empire. Rowman & Littlefield. pp. 18–. ISBN 978-1-4422-0490-4. ^ Goodrich 1976, p. 1066. ^ Peterson 2002, p. 13. ^ Twitchett & Mote 1998, pp. 286–287. ^ Zhang 2008, p. 30. ^ Di Cosmo 2007, p. 3. ^ Li, Gertraude Roth (20 July 2018). Manchu: A Textbook for Reading Documents. University of Hawaii Press. ISBN 9780824822064 – via Google Books. ^ Mote, Twitchett & Fairbank 1988, p. 266. ^ Twitchett & Mote 1998, p. 258. ^ Rawski 1996, p. 834. ^ Rawski 1998, p. 43. ^ Thomas T. Allsen 2011, p. 215. ^ Transactions, American Philosophical Society (vol. 36, Part 1, 1946). American Philosophical Society. pp. 10–. ISBN 978-1-4223-7719-2. ^ Karl August Wittfogel; Chia-shêng Fêng (1949). History of Chinese Society: Liao, 907-1125. American Philosophical Society. p. 10. ^ 萧国亮 (24 January 2007). 明代汉族与女真族的马市贸易. ARTX.cn. p. 1. Retrieved 25 July 2014. ^ Serruys 1955, p. 22. ^ Perdue 2009, p. 127. ^ Peterson 2002, p. 31. ^ Elliott 2001, p. 70. ^ Elliot 2006, p. 38. ^ Fairbank, Goldman 2006, p. 2006. ^ "Summing up Naquin/Rawski". Retrieved 18 March 2015. ^ eds. Watson, Ebrey 1991, p. 175. ^ ed. Walthall 2008, p. 148. ^ "Wayback Machine" (PDF). 11 January 2014. Archived from the original (PDF) on 11 January 2014. ^ Walthall, Anne (2008). Servants of the Dynasty. ISBN 9780520254442. Retrieved 18 March 2015. ^ Dunnell 2004, pp. 76–77. ^ Cassel 2011, p. 205. ^ Cassel 2012, p. 205. ^ Cassel 2011, p. 44. ^ Cassel 2012, p. 44. ^ Rhoads 2011, p. 80. ^ Rhoads 2011, p. 204. ^ Rhoads 2000, p. 204. ^ Rhoads 2011, p. 42. ^ Rhoads 2000, p. 42. ^ Kaske 2008, p. 69. ^ Kaske 2008, p. 51. ^ Kaske 2008, p. 70. ^ Edward J. M. Rhoads (2000). Manchus and Han: Ethnic Relations and Political Power in Late Qing and Early Republican China, 1861–1928. University of Washington Press. pp. 76–77. ISBN 978-0-295-98040-9. ^ Edward J. M. Rhoads (1 December 2011). Manchus and Han: Ethnic Relations and Political Power in Late Qing and Early Republican China, 1861–1928. University of Washington Press. pp. 263–. ISBN 978-0-295-80412-5. ^ Owen Lattimore (1932). Manchuria, Cradle of Conflict. Macmillan. p. 47. ^ Rhoads 2011, p. 270. ^ Rhoads 2000, p. 270. ^ Patrick Fuliang Shan, "Elastic Self-consciousness and the reshaping of Manchu Identity," in Ethnic China: Identity, Assimilation and Resistance, (Lexington and Rowman & Littlefield, 2015), pp. 39–59. ^ "Eras Journal – Tighe, J: Review of "The Manchus", Pamela Kyle Crossley". Archived from the original on 3 March 2011. Retrieved 27 April 2011. ^ Poston, Dudley. The Population Of Modern China. Plenum Press. p. 595. ^ "Census 2000 PHC-T-43. Census: Table 1. First, Second, and Total Responses to the Ancestry Question by Detailed Ancestry Code: 2000" (PDF). census.gov. ^ Evelyn S. Rawski (15 November 1998). The Last Emperors: A Social History of Qing Imperial Institutions. University of California Press. pp. 38–. ISBN 978-0-520-92679-0. ^ Evelyn S. Rawski (15 November 1998). The Last Emperors: A Social History of Qing Imperial Institutions. University of California Press. pp. 242–. ISBN 978-0-520-92679-0. ^ 全国现有满族人口1000多万 会说满语者已不足百人. Retrieved 18 March 2015. ^ 满语"活化石"――"伊兰孛"--文化--人民网. Retrieved 18 March 2015. ^ chinanews. 辽宁一高中开设满语课 满族文化传承引关注. Retrieved 18 March 2015. ^ 满语课首次进入吉林一中学课堂(图). Retrieved 18 March 2015. ^ 中国民族报电子版. Retrieved 18 March 2015. ^ "iFeng: Jin Biao's 10-Year Dream of Manchu Language (traditional Chinese)". ifeng.com. ^ "Shenyang Daily: Young Man Teaches Manchu For Free To Rescue the Language (simplified Chinese)". syd.com.cn. ^ 别让满语文成天书 满语文抢救需靠大众力量[组图]_辽宁_文化. Retrieved 18 March 2015. ^ Edward J. M. Rhoads (1 December 2011). Manchus and Han: Ethnic Relations and Political Power in Late Qing and Early Republican China, 1861–1928. University of Washington Press. pp. 55–. ISBN 978-0-295-80412-5. ^ Mark C. Elliott (2001). The Manchu Way: The Eight Banners and Ethnic Identity in Late Imperial China. Stanford University Press. pp. 242–. ISBN 978-0-8047-4684-7. ^ Pamela Kyle Crossley (15 February 2000). A Translucent Mirror: History and Identity in Qing Imperial Ideology. University of California Press. pp. 172–. ISBN 978-0-520-92884-8. ^ FREDERIC WAKEMAN JR. (1985). The Great Enterprise: The Manchu Reconstruction of Imperial Order in Seventeenth-century China. University of California Press. pp. 49–. ISBN 978-0-520-04804-1. ^ Frederic Wakeman (1 January 1977). Fall of Imperial China. Simon and Schuster. pp. 83–. ISBN 978-0-02-933680-9. ^ Evelyn S. Rawski (15 November 1998). The Last Emperors: A Social History of Qing Imperial Institutions. University of California Press. pp. 99–. ISBN 978-0-520-92679-0. ^ FREDERIC WAKEMAN JR. (1985). The Great Enterprise: The Manchu Reconstruction of Imperial Order in Seventeenth-century China. University of California Press. pp. 902–. ISBN 978-0-520-04804-1. ^ Adam Yuen-chung Lui (1 January 1989). Two Rulers in One Reign: Dorgon and Shun-chih, 1644-1660. Faculty of Asian Studies, Australian National University. pp. 41, 46. ISBN 978-0-7315-0654-5. ^ Serie orientale Roma. Istituto italiano per il Medio ed Estremo Oriente. 1970. p. 174. ^ Elliott 2001, p. 264. ^ Donald F. Lach; Edwin J. Van Kley (1 December 1998). Asia in the Making of Europe, Volume III: A Century of Advance. Book 4: East Asia. University of Chicago Press. pp. 1703–. ISBN 978-0-226-46769-6. ^ 中国奢侈品走出国门 旗袍唐装最受老外青睐(图). Retrieved 18 March 2015. ^ "Xinhua: Small Fergetun with A High Price (simplified Chinese)". xinhuanet.com. ^ 摔跤历史挺悠久不同流派有讲究-青岛报纸电子版. Retrieved 18 March 2015. ^ 新华网吉林频道. Retrieved 18 March 2015. ^ "Xinhua: How Did Chinese Emperors Award Athletes? (simplified Chinese)". xinhuanet.com. ^ a b c d Chinanews.com. "冰嬉"被乾隆定为"国俗" 清军有八旗冰鞋营(5)——中新网. Retrieved 18 March 2015. ^ a b 李敖记起的北京滑冰老人吴雅氏. Retrieved 18 March 2015. ^ 郭德纲 德云社 有话好好说 2011.12.04. YouTube. 4 December 2011. Retrieved 18 March 2015. ^ a b [富育光]满族传统说部艺术——"乌勒本"研考 ·中国民族文学网. Retrieved 18 March 2015. ^ 滿語瀕危 歌者唱作傳承. Retrieved 18 March 2015. ^ Wakeman Jr. 1986, p. 203. ^ The Cambridge History of China: Pt. 1 ; The Ch'ing Empire to 1800. Cambridge University Press. 1978. pp. 64–. ISBN 978-0-521-24334-6. ^ Dunnell & Elliott & Foret & Millward 2004, pp. 123–4. ^ Lopez 1999, p. 20. ^ Berger 2003, p. 35. ^ "National Qing History Compilatory Committee: Sunu Research (simplified Chinese)". historychina.net. An, Shuangcheng (1993). 《满汉大词典》 [A Comprehensive Dictionary of Manchu-Chinese]. Liaoning Nationality Publishing House. ISBN 9787805273785. Agui (1988). 《满洲源流考》 [Researches on Manchu Origins]. Liaoning Nationality Publishing House. ISBN 9787805270609. Aisin Gioro, Yingsheng (2004). 《满语杂识》 [Divers Knowledges of Manchu language]. Wenyuan Publishing House. ISBN 978-7-80060-008-1. Anonymous (1879). 《竹书纪年（校正，光绪五年刻本）》 [Zhu Shu Ji Nian, 1879 Edition]. Dahai; First Historical Archives of China (1990). 《满文老档 译著》 [Old Manchu Archive, Translated Version]. Zhonghua Book Company. ISBN 9787101005875. Du, Jiaji (2008). 《八旗与清朝政治论稿》 [Eight Banner and Qing Dynasty's Political Paper Drafts]. 国家清史编纂委员会·研究丛刊. Renmin Publishing House. ISBN 9787010067537. Du, Jiaji (1997). 《清朝简史》 [Brief History of Qing Dynasty]. 大学历史丛书. Fujian People's Publishing House. ISBN 9787211027163. Fuge (1984). 《听雨丛谈》 [Miscellaneous Discussions Whilst Listening To The Rain]. 歷代史料筆記叢刊·清代史料筆記. Zhonghua Book Company. ISBN 978-7-101-01698-7. Gao, Hehong (2011). 《满族说部传承研究》 [The Research of Manchu Ulabun]. 中国社会科学院民俗学研究书系. China Social Sciences Pres. ISBN 9787500497127. Hu, Zengyi (1994). 《新满汉大词典》 [A Comprehensive Manchu-Chinese Dictionary]. Xinjiang People's Publishing House. ISBN 9787228024049. Hungjeo (2002). 《八旗满洲氏族通谱》 [Eight Manchu Banners' Surname-Clans' Book]. Liaohai Publishing House. ISBN 9787806691892. Jiang, Liangqi (1980). 《东华录》 [Donghua Record]. Zhonghua Book Compary. Jin, Qicong (2009). 《金启孮谈北京的满族》 [Jin Qicong Talks About Beijing Manchus]. Zhonghua Book Company. ISBN 978-7101068566. Jin, Qicong; Kaihe (2006). 《中国摔跤史》 [the Wrestling History of China]. Inner Mongolia People's Publishing House. ISBN 978-7204088096. Aisin Gioro, Jooliyan (1980). 《啸亭杂录》 [Xiaoting Various Records]. 歷代史料筆記叢刊·清代史料筆記. Zhonghua Book Company. ISBN 9787101017519. Li, Lin (2006). 《满族宗谱研究》 [Research of Manchu Genealogy]. Liaoning Nationality Publishing House. ISBN 9787807221715. Li, Yanguang; Guan, Jie (2009). 《满族通史》 [General History of Manchus]. National Publishing House. ISBN 9787805271965. Liu, Jingxian; Zhao, Aping; Zhao, Jinchun (1997). 《满语研究通论》 [General Theory of Manchu Language Research]. Heilongjiang Korean Nationality Publishing House. ISBN 9787538907650. Liu, Xiaomeng (2008). 《清代八旗子弟》 [the Bannermen in Qing Dynasty]. Liaoning Nationality Publishing House. ISBN 978-7-80722-563-8. Meng (孟), Sen (森) (2006). 《满洲开国史讲义》 [the Lecture Note of Early Manchu History]. 孟森著作集. Zhonghua Book Company. ISBN 978-7101050301. National Census Bureau of Chinese State Council (2012). 《中国2010年人口普查资料（上中下）》 [The Data of 2010 China Population Census]. China Statistics Press. ISBN 9787503765070. Ortai (1985). 《八旗通志初集》 [Comprehensive History of the Eight Banners, First Edition]. Northeast Normal University Press. Aisin Gioro, Puyi (2007). 《我的前半生（全本）》 [First Half of My Life, Full Edition]. 我的前半生. Qunzhong Publishing House. ISBN 9787501435579. Song, Lian (1976). 《元史》 [History of Yuan]. 点校本二十四史·清史稿. Zhonghua Book Company. ISBN 9787101003260. Tong, Yonggong (2009). 《满语文与满文档案研究》 [Research of Manchu Language and Archives]. 满族（清代）历史文化研究文库. Liaoning Nationality Publishing House. ISBN 978-7805070438. Toqto'a (1975). 《金史》 [History of Jin]. 点校本二十四史·清史稿. Zhonghua Book Company. ISBN 9787101003253. Various authors (2008). 《清实录》 [Veritable Records of the Qing dynasty]. Zhonghua Book Compary. ISBN 9787101056266. Wang, Yunying (1985). 《清代满族服饰》 [Manchu Traditional Clothes of Qing Dynasty]. Liaoning Nationality Publishing House. Writing Group of Manchu Brief History (2009). 《满族简史》 [Brief History of Manchus]. 中国少数民族简史丛书（修订本）. National Publishing House. ISBN 9787105087259. Yan, Chongnian (2006). 《努尔哈赤传》 [the Biography of Nurhaci]. Beijing Publishing House. ISBN 9787200016598. Yan, Chongnian (2008). 《明亡清兴六十年（彩图珍藏版）》 [60 Years History of the Perishing Ming and Rising Qing, Valuable Colored Picture Edition]. Zhonghua Book Compary. ISBN 9787101059472. Yang, Xichun (1988). 《满族风俗考》 [The Research of Manchu Tradition]. Heilongjiang People's Publishing House. ISBN 9787207005984. Yi, Min-hwan (1978). 《清初史料丛刊第八、九种：栅中日录校释、建州见闻录校释》 [The Collection of Early Qing's Historical Sources, Vol.8 & 9: Records in the Fence; Witness Records of Jianzhou]. History Department of Liaoning University. Zeng, Hui (2010). 《满族服饰文化研究》 [The Research of Manchu Clothing Culture]. 满族的这些事儿丛书. Liaoning Nationality Publishing House. ISBN 9787807229711. Zhao, Erxun (2009). 《清史稿》 [Draft History of Qing]. 点校本二十四史·清史稿. Zhonghua Book Compary. ISBN 9787101007503. Zhang, Jiasheng (2008). 《八旗十论》 [Ten Papers of Eight Banners]. 满族（清代）历史文化研究文库. Liaoning Nationality Publishing House. ISBN 9787807226093. Zhang, Jie; Zhang, Danhui (2005). 《清代东北边疆的满族》 [The Manchus of Manchurian Frontier Region in Qing Dynasty]. Liaoning Nationality Publishing House. ISBN 9787806448656. Zhang, Tingyu (1974). 《明史》 [History of Ming]. 点校本二十四史·清史稿. Zhonghua Book Compary. ISBN 9787101003277. Zheng, Tianting (2010). 《探微集》 [Collection of Minor Research]. 现代史学家文丛. Zhonghua Book Compary. ISBN 9787101069853. Zheng, Tianting (2009). 《郑天挺元史讲义》 [Zheng Tianting's Lectrue Note of Yuan Dynasty History]. Zhonghua Book Compary. ISBN 9787101070132. Aisin Gioro, Ulhicun; Jin, Shi. "Manchuria from the Fall of the Yuan to the rise of the Manchu State (1368–1636)" (PDF). Retrieved 10 March 2014. Association for Asian Studies. Ming Biographical History Project Committee (1976). Goodrich, Luther Carrington (ed.). Dictionary of Ming Biography, 1368–1644, Volume 2 (illustrated ed.). Columbia University Press. ISBN 978-0231038331. Retrieved 10 March 2014. Association for Asian Studies (1987). The Journal of Asian Studies, Volume 46. Cambridge University Press. Chang, Yin-t'ang; University of Washington. Far Eastern and Russian Institute (1956). A Regional handbook on Northeast China. Volume 61 of Human Relations Area Files: Subcontractor's monograph, HRAF. The Institute. Retrieved 10 March 2014. Crossley, Pamela Kyle (1990). Orphan Warriors: Three Manchu Generations and the End of the Qing World (illustrated, reprint ed.). Princeton University Press. ISBN 978-0691008776. Retrieved 10 March 2014. Crossley, Pamela Kyle (2002). A Translucent Mirror: History and Identity in Qing Imperial Ideology. University of California Press. ISBN 978-0-520-23424-6. Crossley, Pamela Kyle (2010). Kagan, Kimberly (ed.). The Imperial Moment. Paul Bushkovitch, Nicholas Canny, Pamela Kyle Crossley, Arthur Eckstein, Frank Ninkovich, Loren J. Samons. Harvard University Press. ISBN 978-0674054097. Retrieved 10 March 2014. Crossley, Pamela Kyle (2002). The Manchus (The People of Asia Series). Blackwell Publishing. ISBN 978-0-631-23591-0. Breuker, Remco E. (2010). Establishing a Pluralist Society in Medieval Korea, 918-1170: History, Ideology and Identity in the Koryŏ Dynasty. Volume 1 of Brill's Korean Studies Library. BRILL. ISBN 978-9004183254. Retrieved 10 March 2014. Cassel, Par Kristoffer (2011). Grounds of Judgment: Extraterritoriality and Imperial Power in Nineteenth-Century China and Japan. Oxford University Press. ISBN 978-0199792122. Retrieved 10 March 2014.
de Rachewiltz, Igor, ed. (1993). In the Service of the Khan: Eminent Personalities of the Early Mongol-Yüan Period (1200-1300). Volume 121 of Asiatische Forschungen. Otto Harrassowitz Verlag. ISBN 978-3447033398. ISSN 0571-320X. Retrieved 10 March 2014. Di Cosmo, Nicola (2007). The Diary of a Manchu Soldier in Seventeenth-Century China: "My Service in the Army", by Dzengseo. Volume 3 of Routledge Studies in the Early History of Asia (annotated ed.). Routledge. ISBN 978-1135789558. Retrieved 10 March 2014. Dunnell, Ruth W.; Elliott, Mark C.; Foret, Philippe; Millward, James A (2004). New Qing Imperial History: The Making of Inner Asian Empire at Qing Chengde. Routledge. ISBN 978-1134362226. Retrieved 10 March 2014. Dvořák, Rudolf (1895). Chinas religionen ... Volume 12; Volume 15 of Darstellungen aus dem Gebiete der nichtchristlichen Religionsgeschichte (illustrated ed.). Aschendorff (Druck und Verlag der Aschendorffschen Buchhandlung). ISBN 978-0199792054. Retrieved 10 March 2014. Gorelova, Liliya M., ed. (2002). Handbook of Oriental Studies. Section 8 Uralic & Central Asian Studies, Manchu Grammar. Volume Seven Manchu Grammar. Brill Academic Pub. ISBN 978-9004123076. Retrieved 6 May 2014. Hauer, Erich (2007). Corff, Oliver (ed.). Handwörterbuch der Mandschusprache. Volume 12; Volume 15 of Darstellungen aus dem Gebiete der nichtchristlichen Religionsgeschichte (illustrated ed.). Otto Harrassowitz Verlag. ISBN 978-3447055284. Retrieved 10 March 2014. Kaske, Elisabeth (2008). The Politics of Language in Chinese Education: 1895 - 1919. Volume 82 of Sinica Leidensia (illustrated ed.). BRILL. ISBN 978-9004163676. Retrieved 10 March 2014. Lee, Robert H. G. (1970). The Manchurian Frontier in Chʼing History. Harvard University Press. ISBN 978-0-674-54775-9. Merriam-Webster, Inc (2003). Merriam-Webster's Collegiate Dictionary. Merriam-Webster. ISBN 978-0-87779-807-1. Mote, Frederick W.; Twitchett, Denis; Fairbank, John K., eds. (1988). The Cambridge History of China: Volume 7, The Ming Dynasty, 1368-1644 (illustrated ed.). Cambridge University Press. ISBN 978-0521243322. Retrieved 10 March 2014. Norman, Jerry (July – September 2003). "The Manchus and Their Language (Presidential Address)". Journal of the American Oriental Society. 123 (No. 3): 483–491. doi:10.2307/3217747. JSTOR 3217747. Huang, Pei (June 1990). "New Light on The Origins of The Manchus". Harvard Journal of Asiatic Studies. 50 (No. 1): 239–282. doi:10.2307/2719229. JSTOR 2719229. Perdue, Peter C (2009). China Marches West: The Qing Conquest of Central Eurasia (reprint ed.). Harvard University Press. ISBN 978-0674042025. Retrieved 10 March 2014. Peterson, Willard J. (2002). the Cambridge History of China, the Ch'ing dynasty to 1800. Cambridge University Press. ISBN 978-0-521-24334-6. Rawski, Evelyn S. (November 1996). "Presidential Address: Reenvisioning the Qing: The Significance of the Qing Period in Chinese History". The Journal of Asian Studies. 55 (No. 4): 829–850. doi:10.2307/2646525. JSTOR 2646525. Reardon-Anderson, James (October 2000). "Land Use and Society in Manchuria and Inner Mongolia during the Qing Dynasty". Environmental History. 5 (No. 4): 503–530. JSTOR 3985584. Rhoads, Edward J. M. (2000). Manchus and Han: Ethnic Relations and Political Power in Late Qing and Early Republican China, 1861–1928. University of Washington Press. ISBN 978-0-295-98040-9. Serruys, Henry (1955). Sino-J̌ürčed relations during the Yung-Lo period, 1403-1424. Volume 4 of Göttinger asiatische Forschungen. O. Harrassowitz. ISBN 978-0742540057. Retrieved 10 March 2014. Seth, Michael J. (2006). A Concise History of Korea: From the Neolithic Period Through the Nineteenth Century. Volume 2 of Tunguso Sibirica (illustrated, annotated ed.). Rowman & Littlefield. ISBN 978-0742540057. Retrieved 10 March 2014. Seth, Michael J. (2010). A History of Korea: From Antiquity to the Present. Volume 2 of Tunguso Sibirica. Rowman & Littlefield Publishers. ISBN 978-0742567177. Retrieved 10 March 2014. Shirokogorov, Sergeĭ Mikhaĭlovich (1924). Social Organization of the Manchus: A study of the Manchu Clan Organization. Volume 3 of Publications (Royal Asiatic Society. North China Branch). Royal Asiatic Society. Sinor, Denis, ed. (1990). The Cambridge History of Early Inner Asia, Volume 1 (illustrated, reprint ed.). Cambridge University Press. ISBN 978-0521243049. Retrieved 10 March 2014. Spence, Jonathan D.; Wills, Jr., John E., eds. (1979). From Ming to Ch'ing: Conquest, Region, and Continuity in Seventeenth-century China (illustrated, revised ed.). Yale University Press. ISBN 978-0300026726. Retrieved 10 March 2014. Spence, Jonathan D. (1988). Tsʻao Yin and the Kʻang-hsi Emperor: Bondservant and Master. Volume 85 of Yale historical publications: Miscellany (illustrated, reprint ed.). Yale University Press. ISBN 978-0300042771. Retrieved 1 September 2014. Tamanoi, Mariko Asano (May 2000). "Knowledge, Power, and Racial Classification: The "Japanese" in "Manchuria"". The Journal of Asian Studies. 59 (No. 2): 248–276. doi:10.2307/2658656. JSTOR 2658656. Taveirne, Patrick (2004). Han-Mongol Encounters and Missionary Endeavors: A History of Scheut in Ordos (Hetao) 1874–1911. Volume 15 of Louvain Chinese studies (illustrated ed.). Leuven University Press. ISBN 978-9058673657. Retrieved 10 March 2014. Tillman, Hoyt Cleveland; West, Stephen H., eds. (1995). China Under Jurchen Rule: Essays on Chin Intellectual and Cultural History (illustrated ed.). SUNY Press. ISBN 978-0791422731. Retrieved 10 March 2014. Twitchett, Denis C.; Franke, Herbert; Fairbank, John King, eds. (1994). The Cambridge History of China: Volume 6, Alien Regimes and Border States, 710-1368 (illustrated, reprint ed.). Cambridge University Press. ISBN 978-0521243315. Retrieved 10 March 2014. Twitchett, Denis C.; Mote, Frederick W., eds. (1998). The Cambridge History of China: Volume 8, The Ming Dynasty, Part 2; Parts 1368-1644. Cambridge University Press. ISBN 978-0521243339. Retrieved 10 March 2014. Vajda, E. J. "Manchu (Jurchen)". Pandora Web Space (Western Washington University). Professor Edward Vajda. Retrieved 16 February 2014. Vollmer, John E. (2002). Ruling from the Dragon Throne: Costume of the Qing Dynasty (1644–1911), Asian Art Series. Ten Speed Press. ISBN 978-1-58008-307-2. Williamson, Mitch (19 May 2011). "Jurchen jin dynasty". Weapons and Warfare. Archived from the original on 18 March 2014. Retrieved 16 February 2014. Wakeman jr., FREDERIC (1986). Great enterprise. University of California Press. ISBN 978-0520048041. Retrieved 10 March 2014. Wu, Shuhui (1995). Die Eroberung von Qinghai unter Berücksichtigung von Tibet und Khams 1717 - 1727: anhand der Throneingaben des Grossfeldherrn Nian Gengyao. Volume 2 of Tunguso Sibirica (reprint ed.). Otto Harrassowitz Verlag. ISBN 978-3447037563. Retrieved 10 March 2014. Wurm, Stephen Adolphe; Mühlhäusler, Peter; Tyron, Darrell T., eds. (1996). Atlas of Languages of Intercultural Communication in the Pacific, Asia, and the Americas, Volume 1. International Council for Philosophy and Humanistic Studies. Walter de Gruyter. ISBN 978-3110134179. Retrieved 10 March 2014. Zhang, Feng (March 2008). "Traditional East Asian Structure from the Perspective of Sino-Korean Relations". International Relations Department The London School of Economics and Political Science. Archived from the original on 20 April 2014. Retrieved 18 April 2014. Zhao, Gang (January 2006). "Reinventing China Imperial Qing Ideology and the Rise of Modern Chinese National Identity in the Early Twentieth Century" (PDF). Modern China. 32 (Number 1): 3–30. doi:10.1177/0097700405282349. JSTOR 20062627. Archived from the original on 25 March 2014. Crossley, Pamela Kyle (1987). "Manzhou Yuanliu Kao and the Formalization of the Manchu Heritage". The Journal of Asian Studies. 46 (4): 761–90. doi:10.2307/2057101. JSTOR 2057101. Crossley, Pamela Kyle (1991). Orphan Warriors: Three Manchu Generations and the End of the Qing World. Princeton University Press. ISBN 978-0-691-00877-6. Huang, Pei. 1990. "New Light on the Origins of the Manchus". Harvard Journal of Asiatic Studies 50 (1). Harvard-Yenching Institute: 239–82. doi:10.2307/2719229. Rawski, Evelyn S. (2001). The Last Emperors: A Social History of Qing Imperial Institutions. University of California Press. ISBN 978-0-520-22837-5. Shao, Dan (2011). Remote Homeland, Recovered Borderland: Manchus, Manchoukuo, and Manchuria, 1907-1985. University of Hawaii Press. ISBN 978-0824834456. Look up Manchu in Wiktionary, the free dictionary. Wikimedia Commons has media related to Manchu people.